My trip to Panama was absolutely incredible! I stayed in Panama City a few days after all the teams left to help set up some things for Global Expeditions. I got in a taxi to go to one of my destinations just outside the city. He went on to explain he had been with his wife for 14 years, 12 years dating and 2 years married. They have a little girl but for the last year they just have not been able to communicate. He said it is like there is a wall between them. I kept asking him questions about what could be causing the problems. He said he had no idea why. I asked if he had talked to a pastor or someone who could help. He had not. We talked for a long time about it, maybe 20 minutes. I told him it sounded like something only God could fix. He agreed. We got to talk about his faith. I shared part of my testimony from when I was a sick little kid and everyone thought I was going to die. It seemed impossible to be healthy again but God made it happen. Even though my health problems were very different problems than his, the same God was in control of both situations and He could make things right in his marriage. On the ride back to the city, I was praying for him and shared the verse that says we can move mountains if we have just the faith of a mustard seed. I got to encourage him to just not give up. I got to share how much God cared about every part of our lives. He cared so much as to die on a cross. I got to pray for him before getting out of the car. I left my Bible with him(after arguing with the Holy Spirit for a second) because he was learning some English. I encouraged him to take out his Spanish Bible and read it side by side with English to help him learn. Really, I don’t care about his English but hopefully it will get him in the Word which washes our minds! I definitely didn’t expect to even talk to my taxi driver that day, let alone make a new friend and get to minister the Gospel. I think it’s awesome that we serve a God who pursues! Crazy! How could such an enormous, indescribable being pursue imperfect people? But He pursued and spoke to Edwin’s heart that day. I remember realizing as soon as Edwin starting sharing his problems that God had something for him. Sometimes I miss these opportunities because of fear or just not realizing. This time it was like He said move out the way and let me work. He left behind a blessing for me as well and increased my faith. If you think of it, please pray for Edwin and his marriage and his little girl. Pray that he continues to discover God at work in his life and surrenders completely to Him. In other news, when I came out of the jungle, I was torn up. 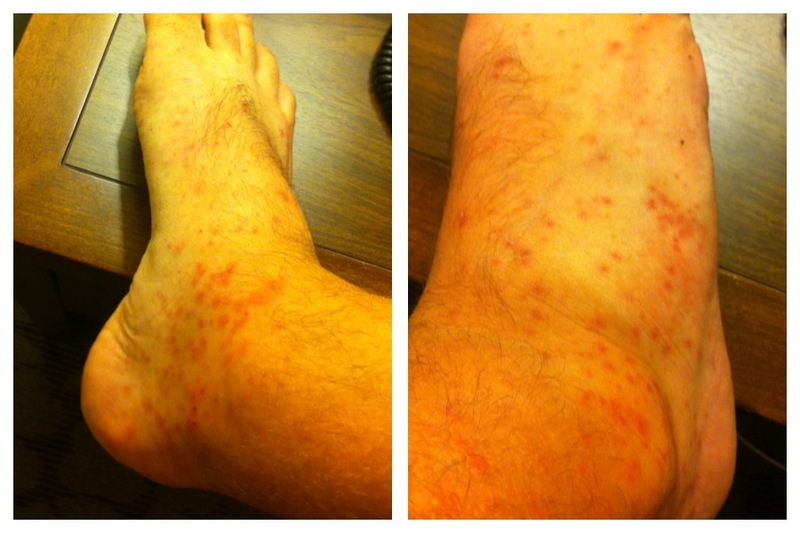 Here’s a pic of my swollen bug-bitten feet. Amber said I looked like I was 400 lbs. in this picture. I had bites all up my legs, all over my back and my sides. The mosquitos and chiggers were evil. It didn’t matter how much bug spray you put on, you were sure to still have a stream of bugs looking for supper. So..who wants to go to Panama? I’m always so inspired when I read your blogs. This is yet another story that also reminds me I lucky to know you. Well written Keith Smith!